You can put your trust in Michigan Monument Company, a division of Kaatz Funeral Directors, Inc., since 1964. 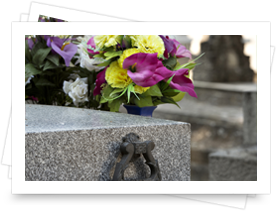 We offer a full line of discounted cemetery markers in granite, bronze and marble in standard and custom sizes with personal service and exceptional quality at our design center. Our unparalleled service, competitive prices, and overall value are why our thousands of loyal customers won't go anywhere else. We look forward to serving you! Also, some families are choosing to scatter the cremated remains of their loved one in a favorite place; the ocean, local fishing spot or even families woods. While that may seem fitting at the time, it means that you do not have a consistent place to connect with the memories of the person you loved so dearly. Having such permanent place - in a cemetery, mausoleum, or cremation garden - that can be visited regularly by family and friends is an essential part of the time following a death. It becomes a focal point of memorialization and gives everyone a special place to go to remember your loved one, or to commemorate important occasions. It can help to make a birthday or anniversary less painful.